Regardless of how Turks vote in snap polls on Nov. 1, there are a few certainties: a) The Islamist Justice and Development Party (AKP), founded by President Recep Tayyip Erdogan in 2001 and now run by his prime minister, Ahmet Davutoglu, will lead the election results; b) Turkey's unpleasant polarization along religious-secular and ethnic Turkish-Kurdish lines will deepen; c) Turkey's self-ridiculing Islamist polity will mostly remain in place; and d) The AKP will either rule in a single-party government or have to share power in a coalition alliance; but it will not disappear. All this is because of the personal ambitions of one man: Erdogan. Recently, at an address to party supporters in Strasbourg, France, the presenter announced Erdogan's name as "the representative of the ummah [global Muslim community]." More recently, a pro-Erdogan columnist for the daily Yeni Akit, Abdurrahman Dilipak, said that Erdogan would become the new caliph once he has won the executive presidential powers he much desires. 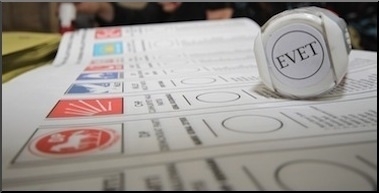 The AKP likely won't win sufficient seats to give Erdogan expanded presidential powers. That, fortunately, looks like a remote possibility, at least as far as the Nov. 1 election is concerned: To amend the constitution in favor of an executive presidential system -- effectively a one-man show -- Davutoglu's AKP must win at least 330 seats in parliament, compared to a mere 258 in previous elections on June 7. Davutoglu is no more than Erdogan's "Medvedev," who rushes from one election meeting to another. The poor man must have exhausted himself, evidenced by that his making a few jaw-dropping statements that his supporters said were merely slips of the tongue. In one such speech, he said that there is a "360 degree difference" between the Islam he defends and the Islam that the Islamic State defends. 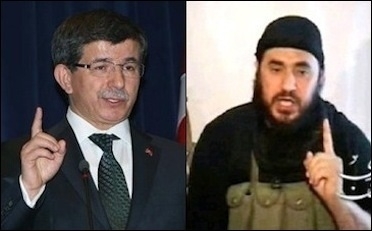 Prime Minister Ahmet Davutoglu (left) said earlier this month that there is a "360 degree difference" (i.e., no difference) between his Islam and that of ISIS. A confession? In elementary mathematics, two things that are 360 degrees from each other are in the exact same position. In another speech, he said that, "wherever there is an oppressor we will be [with him]." Both amusing lines can be shrugged off as being mere gaffes. But Davutoglu said something else that was not a slip of the tongue, probably a reflection of his subconscious anger. Speaking of the Islamic State (IS), whose two suicide bombers killed over 100 people in the heart of Ankara on Oct. 10, Davutoglu used the adjective "ungrateful" for the jihadists. Now, wait there. Ungrateful? Ungrateful for what support or favors jihadists may have taken from Turkey? One opinion poll and a scandalous claim may be the explanation. A Turkish pollster with accurate predictions for Turkey's past three elections, Gezici Research, found that 58.6% of Turks believe that Davutoglu's government did not take necessary preemptive security measures at the site of a peace rally where IS jihadists killed over 100 people and injured hundreds of others. Some of the polled were more direct: More than 20% said the AKP and Erdogan were behind the attack. 1 in 5 Turks think their government was behind the Oct. 10 Ankara terror attack that killed nearly a hundred. A far more serious claim was put forward by opposition members of parliament. Eren Erdem and Ali Seker from the main opposition social-democrat Republican People's Party claimed that the August 2013 chemical attack on the Damascus suburb of Ghouta, which killed hundreds of civilians, was carried out not by the Syrian President Bashar al-Assad's regime but by IS, and that Turkey had produced and delivered the poison gas used in the attack under instructions from the Turkish government. The MPs also claimed that the government ordered a Turkish prosecutor to close the file in a probe into allegations of supplying poison gas to IS. If true, the AKP's act amounts to one act in any legal definition: A crime against humanity. Erdogan, Davutoglu & Co. have struggled all their lives to Islamize Turkey along Sunni supremacist lines. They have no intention of leaving the job unfinished. Hence, their powerful grip on government. Their budget draft for 2016 has all the hints of the country they want to build. According to the government's medium-term economic program, Turkey's intelligence agency (MIT), and the Directorate of Religious Affairs will see dramatic rises in their shares of the 2016 budget. MIT's budget will rise by 47% from 2015. And the budget of the Directorate of Religious Affairs for 2016 will be larger than those of 12 ministries combined. Welcome to the NATO ally Turkey!